There’s something so depressing about a cracked tile. Tiles are meant to match, to create an aesthetically pleasing pattern. To harmonize. One little blemish, and the whole thing is ruined. A cracked tile interrupts the harmony and replaces it with an eyesore. And that, for homeowners and designers and anyone with a discerning eye, can be downright depressing. But luckily, a cracked tile is not a permanent problem. Just find a reliable tile contractor to do the actual replacement work. The difficult part of dealing with a cracked tile is not in the physical fix. The hardest part comes from finding a suitable replacement tile. With matching tile colors: old to new. Ideally, there would be an extra box of original tiles for just that purpose. Which is a good reminder: if you’re ever doing a tiling project, make sure you buy enough extra so you can save yourself future hassle when it comes to matching tile colors. So, with your current cracked tile situation, it’s worth poking around in the basement or garage, just in case the previous contractor did think ahead to leave a stash of matching tiles behind. If you don’t find a stash of tiles, but you do know the contractor who did the tile work in the first place, contact them to see if they have the name of the tile manufacturer. Finding the manufacturer -- and thus going straight to the source -- is your best bet for finding perfectly matching tile colors. But unfortunately, you most likely won’t get off so easy. 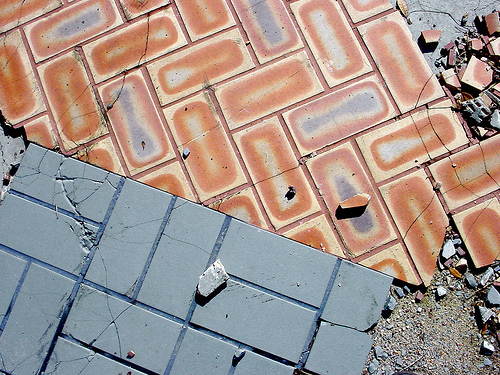 The next step: take your cracked sample to a large tile retail store or supplier. If the tile work was done relatively recently, you may be able to find an exact match. If it’s older, or if it’s an exotic, imported, or custom tile, you probably won't find an identical replica. Still, you may be able to get your hands on something close enough. And depending on where the errant tile sits, a perfect match may not be completely necessary. The final option in the quest for matching tile colors is simply to order a custom replacement. Well, “simply” might be the wrong word. Custom tile is expensive -- upwards of $30 per square foot, with minimum square footage required for orders -- and the process can be quite time consuming. But if you’re determined to find an authentic-looking replacement for your handmade, vintage, or imported tiles, then a custom matching expert may be just the thing you need. Check around with local tile specialists to see if there’s a custom tile company where you live. But if there isn’t, that’s fine. They’re all over the Internet. Tile work, especially antique or artisan tile work, can be a great point of pride in any home. But a chip or a crack in the facade, however disappointing, doesn’t have to equal an aesthetic disaster. There are many options for matching tile colors, and with a little patience and persistence, you’ll be able to restore the impeccable appearance of your home.